Botox is a powerful medicine that can significantly reduce wrinkles, rejuvenate the face, and reduce excessive perspiration of the armpits, palms, and soles. Botox works by limiting contraction of muscles. When used to treat wrinkles, a small amount is placed strategically into muscles of the face and neck that cause wrinkling of the overlying skin when contracted. By impairing contraction, wrinkles become less prominent. Botox reduces excessive sweating by paralyzing the muscles associated with sweat glands and preventing them from expressing sweat. Botox treatment is performed as an outpatient, and treatment only takes a few minutes. The experience and skill of the physician performing the treatments are paramount to achieving optimal results. Too much Botox can result in a frozen or surprised look. Too little, and you may not get the results you want. Any physician using Botox should understand how the muscles of the face work with each other in concert. Some muscles lift, while others depress. Botox has a long history of safety. Although it’s use for wrinkle reduction and excessive sweating is relatively recent, it has been used to treat other medical conditions for about twenty years. The most common side effect when used for wrinkle reduction is bruising; however, more serious side effects can rarely occur including temporary heaviness of the forehead, temporary drooping of the eyelid, and infection. These risks are minimized when an experienced physician performs the treatment. A side effect unique to treating excessive sweating of the palm is temporary weakness in grip strength of the treated hand. Despite its use by millions of people worldwide, there are still many myths about Botox. WANT TO KNOW EVEN MORE ABOUT BOTOX? READ ABOUT BOTOX ON OUR BLOG. Botox treatment costs vary depending on the areas treated and the amount used. Costs are generally lower for women since less Botox is needed. Men usually require about 1.5 times as much Botox as women. The following is a list of amounts often required to treat certain areas. 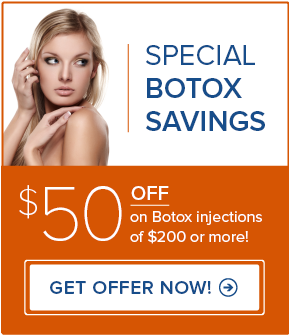 Botox Cosmetic is not the only brand of botulinum toxin available. The other two are Dysport and Xeomin. These products are manufactured by different companies, and there are slight differences between them. There is a company developing a Botox cream, but it is not available yet.